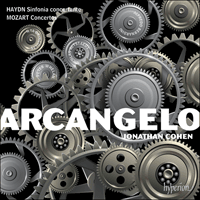 Mozart’s sublime Oboe Concerto and Bassoon Concerto (he wrote only one of each) are conjured into thrilling life by Arcangelo under the direction of Jonathan Cohen. In the Haydn Sinfonia concertante—written at the very zenith of the composer’s artistic popularity—four soloists combine with the orchestra in a spiral of theatrical competition. Mozart’s status as the concerto composer par excellence is assured above all by the great series of Viennese piano concertos with which he promoted himself in the twin roles of composer and virtuoso. Except for the clarinet concerto from his final year, his assorted wind concertos are not on their exalted level. Yet whether writing for flute, oboe, horn or bassoon, Mozart seems to have had an uncanny understanding of each instrument’s character and idiosyncrasies. Friendship, too, played its part. The concertos for horn and clarinet were influenced by the playing styles and personalities of Joseph Leutgeb and Anton Stadler, both close friends of Mozart in Vienna. The tonal finesse and dexterity of his Salzburg colleague Giuseppe Ferlendis—perhaps, too, his sense of fun—left their mark on the sole oboe concerto. Mozart wrote to his father from Mannheim in February 1778: ‘I love it when an aria fits a singer’s voice precisely, like a well-tailored dress.’ He might well have echoed these sentiments apropos his wind concertos, each one perfectly tailored to the instrument and, from what we know, its performer. It was long assumed that Mozart’s earliest wind concerto, and his only one for bassoon (he may have composed three or four others, now lost), was written for the bassoon-playing baron Thaddäus von Dürnitz. But, as scholars now agree, this is jumping the gun: Mozart only met Dürnitz in Munich in December 1774, whereas the Bassoon Concerto in B flat major, K191/186e, bears the date 4 June 1774. We can guess that he wrote it for one or other of the bassoonists in the Salzburg Court Orchestra, Melchior Sandmayr (who also played the oboe—wind players were expected to multi-task in those days) or Johann Heinrich Schulz. Perhaps they both played the concerto at different times. The eighteen-year-old Mozart gives full rein to the bassoon’s clownish side in the first movement’s quickfire repeated notes and vertiginous leaps, with the instrument morphing between high tenor and basso profundo. But during the eighteenth century the instrument had become mellower and more expressive. By the turn of the nineteenth Koch’s Musikalisches Lexicon dubbed the bassoon ‘Ein Instrument der Liebe’ (‘an instrument of love’). Mozart duly exploited its potential for eloquent cantabile and, especially in the slow movement, the peculiar plangency of its high tenor register. A decade later, in his great Viennese piano concertos, Mozart liked to work with an expansive array of themes. Scored for a small orchestra of oboes, horns (which in the key of B flat lend a ringing brilliance to the tuttis) and strings, the bassoon concerto is a much more compact affair. In the first movement Mozart contents himself with just two subjects: the proudly striding, wide-ranging opening theme, perfectly fashioned for the bassoon (the wide leaps here sound dignified rather than comical), and a second theme featuring spiky violin staccatos against sustained oboes and horns. The bassoon later adorns this with its own countermelody. Then in the recapitulation the roles are reversed, with the bassoon playing the staccato tune and the violins the countermelody—a delicately witty touch. As in Mozart’s violin concertos of 1775, the slow movement, with muted violins and violas, is a tender operatic aria reimagined in instrumental terms. The opening phrase is a favourite Mozartian gambit that will reach its apogee in the Countess’s ‘Porgi amor’ in Le nozze di Figaro. As in a heartfelt opera seria aria, the soloist’s leaps and plunges are now charged with intense expressiveness. For his finale Mozart writes a rondo in minuet tempo, a fashionable form in concertos of the 1760s and 1770s. With its frolicking triplets and semiquavers, the bassoon delights in undercutting the galant formality of the refrain. When the soloist finally gets to play the refrain, its Till Eulenspiegel irreverence seems to infect the orchestra. First and second violins dance airily around the bassoon, oboes cluck approvingly. The soloist then bows out with a cheeky flourish, leaving the final tutti to restore decorum. The young Bergamo-born oboist Giuseppe Ferlendis (1755–1802) was already a famous virtuoso by the time he joined the Salzburg Court Orchestra in April 1777. Mozart quickly befriended him (they were almost exactly the same age) and during the spring or summer wrote the Oboe Concerto in C major, K314/271k, for him. A few months later, pressed for time to fulfil a commission in Mannheim from the flautist De Jean, Mozart adapted the concerto for flute, upping the tempo of the finale from Allegretto to Allegro and transposing the music from C to D.
In its original oboe version, the work was one of Mozart’s most successful concertos in his lifetime. It became something of a party piece for his Mannheim friend Friedrich Ramm, whom Mozart later rewarded with the Oboe Quartet in F major, K370. Scored for the same small Salzburg orchestra as the bassoon concerto (oboes, horns and strings), the concerto is deftly and gracefully written, calculated to display both the oboe’s impish wit and (in the Adagio non troppo) its piercing cantabile. Textures are light and luminous, with the soloist often accompanied by violins alone. In the first movement, marked Allegro aperto (‘aperto’ means ‘openly’, denoting the music’s breezy, extrovert character), the oboe enters with a brief upward scale followed by a sustained high note above the main theme in the orchestra—a recreation of a vocal technique known as ‘messa di voce’, testing a singer’s ‘taste’ and breath control. Another piquant touch is the way the oboe later seizes on the Papageno-ish cadential phrase of the orchestral introduction and adapts it to its own puckish ends. The Adagio non troppo, in abridged sonata form (with a brief middle section leading to a compressed recapitulation), is another operatic aria, with the oboe impersonating a soulful soprano. Among the music’s delights are characteristic touches of Mozartian chromaticism—all the more telling amid so much simple diatonic harmony—and a second theme delicately fashioned as a dialogue between oboe and violins. But the most vivid movement is surely the irrepressible rondo finale, whose chuckling refrain Mozart remembered in Blonde’s triumphant aria ‘Welche Wonne, welche Lust’ from Die Entführung aus dem Serail. 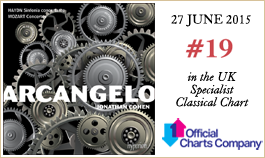 Another theme, first heard towards the end of the orchestral tutti, sounds completely new, though it turns out to be a concealed variation of the refrain, rhythmically transformed (with longer note values) and worked in airy canonic imitation. With typical sly humour, Mozart later flags the connection when the oboe pretends to start up the ‘new’ tune before nonchalantly continuing with the refrain. ‘A new concertante from Haydn combined with all the excellencies of music; it was profound, airy, affecting and original, and the performance was in unison with the merit of the composition. Salomon particularly exerted himself on this occasion, in doing justice to the music of his friend Haydn.’ So wrote the London Morning Herald after the premiere of Haydn’s Sinfonia concertante in B flat major for violin (a starring role for the orchestral leader and impresario Johann Peter Salomon), oboe, cello and bassoon on 9 March 1792. Haydn had recently premiered two symphonies (Nos 93 and 98) in Salomon’s concert series in the Hanover Square Rooms. The sensationally successful premiere of the ‘Surprise’, No 94, would follow two weeks later. Amid his symphonic triumphs, Haydn had hastily composed his ‘Concertante’ (as he called it) in a spirit of rivalry with the Professional Concert directed by his one-time pupil Ignaz Pleyel. The genre of the ‘symphonie concertante’, or multiple concerto, had been popularized by composers such as J C Bach and the Mannheimer Carl Stamitz. In the 1780s Pleyel got in on the act, writing reams of ‘symphonies concertantes’ first for Paris and later for London. Needless to say, Haydn outdid the facile, garrulous Pleyel at his own game. Tuneful and unfailingly inventive, this multiple concerto uses the four solo instruments in ever-changing permutations: the wind pair pitted against the strings, the two higher instruments against the two lower, violin and bassoon against oboe and cello (as at the beginning of the Andante), or simply as a quartet of contrasting timbres. Alongside the dynamism of the contemporary London symphonies, the opening Allegro seems leisurely and urbane, governed by a (for Haydn) relatively slow rate of harmonic change. With four soloists to showcase, the composer seeks to charm rather than challenge. Contrasts of colour and virtuoso display take precedence over taut thematic argument. But from the moment the soloists breeze in casually in the middle of the opening tutti, the music is full of Haydnesque wit and subtlety. At the ‘official’ solo entry, the two aspects of the main theme are artfully shared between the string and wind pairs: the violin and cello in turn sing the lyrical opening phrase, while the rumbustious response for full orchestra is reinterpreted by the oboe and bassoon. There is a particularly inspired development, initiated by the main theme (on the cello) in the shadowy key of D flat major—rich and strange after the preceding F major—and evolving into a beautiful imitative dialogue, with poignant chromatic sideslips. These imitative chromatic textures find their echo in the elaborately worked cadenza, conceived by Haydn as the movement’s expressive climax. The F major Andante, in Haydn’s favourite 6/8 pastoral metre, omits trumpets, drums, bassoons and one of the orchestral oboes. This delightful movement is in essence relaxed chamber music for the soloists, briefly interrupted by an unexpected appearance of the main theme in the orchestra. Specializing in ‘sudden surprises of abrupt rests’, as the London Oracle put it, the finale matches those of the first six London symphonies in ebullience and contrapuntal resource. After a rousing tutti, the appearance of the catchy contredanse theme is twice delayed by mock-portentous recitatives for Salomon. Haydn later repeats this ploy following another of his brilliant contrapuntal developments. Just before the final send-off he has one more surprise up his sleeve, plunging the music from the apparently secure home key of B flat to G flat major—a more theatrical counterpart to the similar harmonic gambit in the first movement’s development. Le fait que Mozart soit considéré comme le compositeur de concertos «par excellence» tient surtout à la grande série de concertos pour piano viennois qui assurèrent sa promotion de compositeur et de virtuose. À l’exception du concerto pour clarinette composé la dernière année de sa vie, ses divers concertos pour instruments à vent ne sont pas d’un niveau aussi élevé. Pourtant, qu’il ait écrit pour flûte, hautbois, cor ou basson, Mozart semble avoir eu une étonnante compréhension du caractère de l’instrument et de ses particularités. L’amitié joua également un rôle important. Les concertos pour cor et pour clarinette furent influencés par le jeu et la personnalité de Joseph Leutgeb et d’Anton Stadler, tous deux des amis proches de Mozart à Vienne. La finesse sonore et la dextérité de son collègue salzbourgeois Giuseppe Ferlendis—peut-être aussi son sens de l’humour—marquèrent le seul concerto pour hautbois. Mozart écrivit à son père de Mannheim en février 1778: «J’adore quand une aria correspond exactement à la voix d’un chanteur, comme une robe bien taillée.» Il aurait très bien pu reprendre de telles idées à propos de ses concertos pour instruments à vent dont chacun est parfaitement adapté à l’instrument et, autant qu’on le sache, à son interprète. On a longtemps supposé que le premier concerto pour instrument à vent de Mozart, son seul concerto pour basson (il en a peut-être composé trois ou quatre autres, aujourd’hui perdus), fut écrit pour le baron Thaddäus von Dürnitz qui jouait de cet instrument. Mais, comme s’accordent à le dire de nos jours les spécialistes, c’est allé un peu vite: Mozart ne fit la connaissance de Dürnitz à Munich qu’au mois de décembre 1774, alors que le Concerto pour basson en si bémol majeur, K 191/186e, porte la date du 4 juin 1774. On peut penser qu’il l’écrivit pour l’un ou l’autre des bassonistes de l’Orchestre de la cour de Salzbourg, Melchior Sandmayr (qui jouait aussi du hautbois—les instrumentistes à vent étaient censés occuper plusieurs emplois simultanément à cette époque) ou Johann Heinrich Schulz. Ils jouèrent peut-être tous deux ce concerto à des dates différentes. À l’âge de dix-huit ans, Mozart donne libre cours au côté clownesque du basson dans les notes répétées rapides et les sauts vertigineux du premier mouvement, l’instrument évoluant entre le ténor aigu et la basse profonde. Mais au cours du XVIIIe siècle, il était devenu plus mélodieux et plus expressif. Au début du XIXe siècle, le Musikalisches Lexicon de Koch qualifia le basson d’«Ein Instrument der Liebe» («un instrument d’amour»). Mozart exploita dûment son potentiel de cantabile éloquent et, surtout dans le mouvement lent, le côté sonore spécifique de son registre ténor aigu. Dix ans plus tard, dans ses grands concertos pour piano viennois, Mozart aima travailler avec une large gamme de thèmes. Écrit pour un petit orchestre avec hautbois, cors (qui dans la tonalité de si bémol prêtent un éclat retentissant aux tuttis) et cordes, le concerto pour basson est beaucoup plus concis. Dans le premier mouvement, Mozart se contente juste de deux sujets: le thème initial de grande envergure qui avance fièrement à grands pas, parfaitement façonné pour le basson (les larges sauts semblent ici plus empreints de dignité que de comique), et un second thème avec des staccatos piquants des violons sur une trame soutenue de hautbois et de cors. Le basson le pare ensuite de son propre contrechant. Puis, dans la réexposition, les rôles sont inversés, le basson jouant l’air staccato et les violons le contrechant—une touche délicatement spirituelle. Comme dans les concertos pour violon de Mozart écrits en 1775, le mouvement lent, avec les violons et les altos en sourdine, est une tendre aria lyrique réimaginée en termes instrumentaux. La phrase initiale est un procédé favori de Mozart qui atteindra son apogée dans l’air de la comtesse «Porgi amor» des Noces de Figaro. Comme dans une aria d’opera seria qui vient du cœur, les sauts et les plongeons du soliste sont maintenant chargés d’une intense expressivité. Pour son finale, Mozart écrit un rondo dans un tempo de menuet, une forme prisée dans les concertos des années 1760 et 1770. Avec ses triolets et ses doubles croches enjouées, le basson se plaît à saper la solennité galante du refrain. Lorsque le soliste en vient finalement à jouer le refrain, son irrévérence à la manière de Till Eulenspiegel semble contaminer l’orchestre. Les premiers et seconds violons dansent avec désinvolture autour du basson, les hautbois gloussent d’un ton approbateur. Le soliste tire alors sa révérence avec une ornementation impertinente, laissant au tutti final le soin de rétablir la bienséance. Né à Bergame, le jeune hautboïste Giuseppe Ferlendis (1755–1802) était déjà un virtuose célèbre lorsqu’il entra dans l’Orchestre de la cour de Salzbourg en avril 1777. Mozart se lia vite d’amitié avec lui (il avait presque exactement le même âge) et, au cours du printemps ou de l’été, il écrivit pour lui son Concerto pour hautbois en ut majeur, K 314/271k. Quelques mois plus tard, pressé par le temps pour réaliser une commande du flûtiste De Jean à Mannheim, Mozart adapta ce concerto pour la flûte, en augmentant le tempo du finale d’Allegretto à Allegro et en transposant l’ensemble de la musique d’ut majeur à ré majeur. Dans sa version originale pour hautbois, cette œuvre est l’un des concertos de Mozart qui remporta le plus de succès de son vivant. Il devint une sorte de morceau de référence pour son ami de Mannheim Friedrich Ramm, que Mozart récompensa plus tard avec le Quatuor avec hautbois en fa majeur, K 370. Instrumenté pour le même petit orchestre de Salzbourg que le Concerto pour basson (hautbois, cors et cordes), ce concerto est écrit avec adresse et grâce, conçu pour révéler à la fois l’esprit espiègle du hautbois et (dans l’Adagio non troppo) son cantabile intense. Les textures sont légères et lumineuses, le soliste étant souvent accompagné des seuls violons. Dans le premier mouvement, marqué Allegro aperto («aperto» signifie «ouvertement», dénotant le caractère enjoué et extraverti de la musique), le hautbois entre avec une courte gamme ascendante suivie d’une note aiguë soutenue au-dessus du thème principal à l’orchestre—une reconstitution d’une technique vocale appelée «messa di voce», pour tester le «goût» d’un chanteur et son contrôle de la respiration. Autre touche piquante: la manière dont le hautbois saute ensuite sur la phrase cadentielle à la Papageno de l’introduction orchestrale et l’adapte à ses propres fins malicieuses. L’Adagio non troppo, dans une forme sonate abrégée (avec une courte section centrale qui mène à une réexposition condensée), est une autre aria lyrique, le hautbois imitant une soprano mélancolique. Parmi les joies de cette musique figurent des touches caractéristiques de chromatisme mozartien—d’autant plus efficaces au milieu d’une harmonie diatonique d’une telle simplicité—et un deuxième thème délicatement façonné comme un dialogue entre le hautbois et les violons. Mais le mouvement le plus éclatant est sans aucun doute l’exubérant rondo finale, dont Mozart s’est souvenu du refrain gloussant dans l’aria triomphale «Welche Wonne, welche Lust» de Blonde dans L’Enlèvement au sérail. Un autre thème, exposé pour la première fois vers la fin du tutti orchestral, semble totalement nouveau, mais il s’avère être une variation dissimulée du refrain, transformé sur le plan rythmique (avec des valeurs de notes plus longues) et travaillé en imitation canonique insouciante. Avec un humour narquois typique, Mozart balise ensuite le moment où le hautbois prétend attaquer le «nouvel» air avant de continuer le refrain avec nonchalance. «Une nouvelle symphonie concertante de Haydn avec toutes les qualités de la musique; elle était profonde, légère, émouvante et originale, et l’interprétation était à l’unisson des mérites de la composition. Salomon s’est particulièrement appliqué à cette occasion, en rendant justice à la musique de son ami Haydn.» Voici ce qu’écrivait le Morning Herald de Londres après la création de la Sinfonia concertante en si bémol majeur de Haydn pour violon (un rôle vedette pour le violon solo et imprésario de l’orchestre Johann Peter Salomon), hautbois, violoncelle et basson, le 9 mars 1792. Haydn avait récemment créé les symphonies nos 93 et 98 dans la série de concerts de Salomon aux Hanover Square Rooms. Le succès retentissant de la création de la «Surprise», nº 94, allait suivre deux semaines plus tard. Au milieu de ses triomphes symphoniques, Haydn avait composé à la hâte sa «Concertante» (comme il l’appelait) dans un esprit de rivalité avec le Concert Professional dirigé par son ancien élève Ignaz Pleyel. Le genre de la «symphonie concertante», ou concerto à plusieurs solistes, avait été popularisé par des compositeurs comme J. C. Bach et Carl Stamitz de Mannheim. Dans les années 1780, Ignaz Pleyel y vint à son tour, écrivant des tonnes de symphonies concertantes tout d’abord pour Paris, puis pour Londres. Il va sans dire que Haydn surpassa le superficiel et volubile Pleyel à son propre jeu. Mélodieux et infailliblement inventif, ce concerto à plusieurs solistes utilise les quatre instruments dans des permutations en évolution constante: les deux instruments à vent se mesurant aux cordes, les deux instruments aigus aux deux instruments graves, le violon et le basson opposés au hautbois et au violoncelle (comme au début de l’Andante), ou simplement comme un quatuor de timbres contrastés. À côté du dynamisme des symphonies londoniennes contemporaines, l’Allegro initial semble calme et raffiné, marqué par un nombre relativement réduit (pour Haydn) de changements harmoniques. Avec quatre solistes à présenter, le compositeur cherche davantage à charmer qu’à défier. Les contrastes de couleur et les démonstrations de virtuosité ont la priorité sur un argument thématique tendu. Mais à partir du moment où les solistes entrent d’un air dégagé au milieu du tutti initial, la musique regorge de l’esprit et de la subtilité de Haydn. À l’entrée «officielle» du solo, les deux aspects du thème principal sont ingénieusement partagés entre les deux instruments à cordes et les deux instruments à vent: le violon et le violoncelle chantent à tour de rôle la phrase lyrique initiale, tandis que la réponse sonore de tout l’orchestre est réinterprétée par le hautbois et le basson. Il y a un développement particulièrement inspiré, amorcé par le thème principal (au violoncelle) dans la sombre tonalité de ré bémol majeur—riche et étrange après le fa majeur précédent—pour évoluer ensuite sous la forme d’un magnifique dialogue en imitation, avec des glissements chromatiques poignants. Ces textures chromatiques imitatives trouvent leur écho dans la cadence élaborée, conçue par Haydn comme le sommet expressif du mouvement. L’Andante en fa majeur, dans la métrique pastorale préférée de Haydn, oublie les trompettes, les timbales, les bassons et l’un des hautbois de l’orchestre. Ce mouvement agréable est par essence de la musique de chambre détendue pour les solistes, brièvement interrompue par une apparition inattendue du thème principal à l’orchestre. Le finale, qui se concentre sur «les surprises soudaines provenant de brusques silences», comme le dit l’Oracle de Londres, égale ceux des six premières symphonies londoniennes en exubérance et en ressources contrapuntiques. Après un tutti exaltant, l’apparition du thème entraînant de la contredanse est retardée deux fois par de pseudo récitatifs pour Salomon. Haydn reprend ensuite ce stratagème à la suite d’un autre de ses brillants développements contrapuntiques. Juste avant l’adieu final, il a encore une surprise en réserve, plongeant la musique de la tonalité d’origine apparemment sûre de si bémol majeur dans celle de sol bémol majeur—homologue plus théâtral de la ruse harmonique analogue dans le développement du premier mouvement. Mozarts Status als Komponist von Instrumentalkonzerten par excellence festigte sich in erster Linie durch die Reihe seiner großen Wiener Klavierkonzerte, mit denen er sich sowohl als Komponist wie auch als Virtuose präsentierte. Mit Ausnahme des Klarinettenkonzerts aus seinem letzten Lebensjahr befinden sich seine diversen Bläserkonzerte allerdings nicht auf demselben erhöhten Niveau. Doch ob er nun für Flöte, Oboe, Horn oder Fagott schrieb, besaß Mozart offenbar ein verblüffend genaues Verständnis des Charakters und der Eigenheiten der Instrumente. Freundschaften spielten ebenfalls eine wichtige Rolle. Die Konzerte für Horn und Klarinette waren jeweils auf die Persönlichkeit und Spieltechnik von Joseph Leutgeb und Anton Stadler, beide enge Freunde Mozarts in Wien, abgestimmt. Die musikalische Finesse und Fingerfertigkeit seines Salzburger Kollegen Giuseppe Ferlendis—und möglicherweise auch dessen Lebensfreude—prägten das einziges Oboenkonzert. Im Februar 1778 schrieb Mozart aus Mannheim an seinen Vater: „… ich liebe daß die aria einem sänger so accurat angemessen seÿ, wie ein gutgemachts kleid.“ Man darf wohl davon ausgehen, dass er im Falle seiner Bläserkonzerte genauso dachte, da jedes genau dem jeweiligen Instrument und auch—soweit bekannt ist—dem Ausführenden angepasst ist. Man hat lange angenommen, dass Mozarts frühestes Konzert für Blasinstrument, sowie das einzige für Fagott (er komponierte möglicherweise drei oder vier weitere, die heute jedoch verschollen sind), für den Fagott spielenden Baron Thaddäus von Dürnitz entstand. Heute ist man sich in der Forschung jedoch einig, dass diese Einschätzung voreilig war: Mozart lernte Dürnitz erst im Dezember 1774 in München kennen, doch ist das Fagottkonzert in B-Dur, KV 191/186a, auf den 4. Juni 1774 datiert. Es ist anzunehmen, dass es für einen der Fagottisten des Salzburger Hoforchesters entstand, entweder Melchior Sandmayr (der auch Oboe spielte—Bläser mussten zu jener Zeit vielseitig einsetzbar sein) oder Johann Heinrich Schulz. Möglicherweise spielten beide das Konzert zu unterschiedlichen Zeitpunkten. Der 18-jährige Mozart lässt der albernen Seite des Fagotts in den schnellen Tonrepetitionen und waghalsigen Sprüngen des ersten Satzes freien Lauf, wobei das Instrument sowohl das hohe Tenor- als auch das tiefe Bass-Register durchläuft. Im Laufe des 18. Jahrhunderts war der Klang des Fagotts milder und expressiver geworden. Zu Beginn des 19. Jahrhunderts wurde es in Kochs Musikalischem Lexikon als „Ein Instrument der Liebe“ bezeichnet. Mozart machte von seinen eloquenten kantablen Qualitäten gebührenden Gebrauch und ließ vor allem im langsamen Satz die besondere, klagende Note des hohen Tenorregisters erklingen. In seinen großen Wiener Klavierkonzerten zehn Jahre später arbeitete Mozart bevorzugt mit umfangreichen Themenpaletten. Das Fagottkonzert hingegen, mit einer Anlage für kleines Orchester mit Oboen, Hörnern (die in der Tonart B-Dur in den Tutti-Passagen für eine klangvolle Brillanz sorgen) und Streichern, ist eine deutlich kompaktere Angelegenheit. Im ersten Satz gibt Mozart sich mit lediglich zwei Themen zufrieden—das stolz umherschreitende, weitgespannte Anfangsthema ist dem Fagott geradezu auf den Leib geschrieben (die weiten Sprünge klingen hier würdevoll und nicht komisch) und das zweite Thema enthält spitze Staccato-Passagen für die Violinen, die gegen die ausgehaltenen Oboen und Fagotte gesetzt sind. Später wird dies vom Fagott mit seiner eigenen Gegenmelodie verziert. In der Reprise werden die Rollen vertauscht, das Fagott spielt die Staccato-Melodie und die Geigen die Gegenmelodie—ein geistreicher Kunstgriff. Ebenso wie in Mozarts Violinkonzerten von 1775 ist auch der langsame Satz hier, mit gedämpften Violinen und Violen, eine instrumental ausgearbeitete Opernarie. Die Eröffnungsphrase ist ein bevorzugter Schachzug Mozarts, der in der Sopranarie „Porgi amor“ der Gräfin Almaviva in Figaros Hochzeit seinen Höhepunkt erreichen sollte. Ebenso wie in einer tiefempfundenen Arie einer Opera seria sind die Sprünge und Stürze des Solisten nun mit intensiver Expressivität aufgeladen. Das Finale legt Mozart als Rondo im Menuett-Tempo an—ein beliebtes Stilmittel in Instrumentalkonzerten der 60er und 70er Jahre des 18. Jahrhunderts. Das Fagott vergnügt sich mit seinen scherzenden Triolen und Sechzehnteln damit, die galante Formalität des Refrains zu untergraben. Wenn das Soloinstrument schließlich den Refrain spielt, scheint das Orchester mit einer eulenspiegelartigen Respektlosigkeit infiziert zu sein. Die ersten und zweiten Geigen tanzen sorglos um das Fagott herum, während die Oboen anerkennend dazu gackern. Der Solist verabschiedet sich dann mit einer kecken Geste, so dass im letzten Tutti der Anstand wiederhergestellt werden muss. Der junge, aus Bergamo stammende Oboist Giuseppe Ferlendis (1755–1802) war bereits ein berühmter Virtuose, als er im April 1777 dem Salzburger Hoforchester beitrat. Mozart freundete sich schnell mit ihm an (sie waren praktisch gleichaltrig) und im Frühling oder Sommer schreib für ihn sein Oboenkonzert in C-Dur, KV 314/271k. Als Mozart einige Monate später unter Zeitdruck stand und in Mannheim ein Auftragswerk für den Flötisten De Jean fällig war, richtete er jenes Konzert für Flöte ein, steigerte das Tempo des letzten Satzes von Allegretto zu Allegro und transponierte das Stück von C-Dur nach D-Dur. In der ursprünglichen Fassung für Oboe war das Werk eines der erfolgreichsten Instrumentalkonzerte Mozarts zu seinen Lebzeiten. Sein Mannheimer Freund Friedrich Ramm führte es schließlich als sein Kabinettstückchen auf—und wurde von Mozart später mit dem Oboenquartett KV 370 belohnt. Das Konzert hat dieselbe kleine Salzburger Orchesterbesetzung wie das Fagottkonzert (Oboen, Hörner, Streicher) und ist geschickt und anmutig komponiert, um den schelmischen Witz der Oboe sowie (im Adagio non troppo) ihr durchdringendes Kantabile zum Ausdruck zu bringen. Die Strukturen sind hell und durchsichtig, wobei das Soloinstrument oft von den Violinen allein begleitet wird. Im ersten Satz, der mit Allegro aperto („aperto“ bedeutet „offen“, was auf den lässigen, extravertierten Charakter der Musik hinweist) überschrieben ist, setzt die Oboe mit einer kurzen aufwärts gerichteten Tonleiter ein, auf die ein ausgehaltener Ton über dem Hauptthema des Orchesters folgt—eine Nachbildung der Vokaltechnik, die als „messa di voce“ bezeichnet wird, mit der der „Geschmack“ und die Atemkontrolle des Sängers geprüft wird. Ein weiterer pikanter Kunstgriff ist die Art und Weise, mit der die Oboe später die Papageno-artige Kadenz der Orchestereinleitung aufgreift und zum eigenen, spitzbübischen Zweck verwendet. Das Adagio non troppo steht in verkürzter Sonatenform (mit einem kurzen Mittelteil, der in eine komprimierte Reprise hineinleitet) und ist eine weitere Opernarie, wobei die Oboe eine gefühlvolle Sopranstimme darstellt. Die charakteristischen Anflüge Mozart’scher Chromatik sind hier besonders reizvoll—innerhalb so schlichter diatonischer Harmonie besonders vielsagend—wie auch ein zweites Thema, welches sorgfältig als Dialog zwischen Oboe und Geigen ausgestaltet ist. Der lebhafteste Moment muss jedoch das unbändige Rondo-Finale sein, dessen kichernden Refrain Mozart bei Blondes triumphierender Arie „Welche Wonne, welche Lust“ in der Entführung aus dem Serail im Hinterkopf hatte. Ein weiteres Thema, das erstmals gegen Ende des Orchestertuttis zu hören ist, klingt völlig neu, obwohl es sich dann als verdeckte Variation des Refrains erweist, rhythmisch umgewandelt (nun mit längeren Notenwerten) und mit luftiger kanonischer Imitation versehen. Mit typisch schlitzohrigem Humor macht Mozart später auf die Verbindung aufmerksam, wenn die Oboe so tut, als spiele sie eine „neue“ Melodie, bevor sie nonchalant mit dem Refrain fortfährt. „Eine neue «Concertante» von Haydn mit allen musikalischen Vortrefflichkeiten versehen; sie war tiefgehend, federleicht, bewegend und originell, und die Aufführung stand im Einklang mit dem Rang der Komposition. Salomon bemühte sich diesmal besonders, und wurde damit der Musik seines Freundes Haydn gerecht.“ So der Londoner Morning Herald nach der Premiere von Haydns Sinfonia concertante in B-Dur für Violine (eine Star-Rolle für den Konzertmeister und Impresario Johann Peter Salomon), Oboe, Violoncello und Fagott am 9. März 1792. Haydn hatte unlängst die Symphonien Nr. 93 und 98 im Rahmen der von Salomon veranstalteten Konzertreihe in den Londoner Hanover Square Rooms uraufgeführt. Die sensationell erfolgreiche Premiere der Symphonie mit dem Paukenschlag, Nr. 94, sollte zwei Wochen später folgen. Inmitten seiner symphonischen Triumphe hatte Haydn unter beträchtlichem Zeitdruck seine „Concertante“ (wie er sie nannte) komponiert, wobei ein Konkurrenzgeist gegenüber der Reihe „Professional Concert“ seines ehemaligen Schülers Ignaz Pleyel eine nicht unwichtige Rolle spielte. Das Genre der „konzertanten Symphonie“, oder des mehrfachen Instrumentalkonzerts, war von Komponisten wie Johann Christian Bach oder dem Mannheimer Carl Stamitz popularisiert worden. In den 1780er Jahren gesellte sich Pleyel dieser Bewegung hinzu und komponierte Unmengen von „konzertanten Symphonien“ zunächst für Paris und später für London. Es versteht sich von selbst, dass Haydn den etwas banalen, langatmigen Pleyel mit seinen eigenen Waffen schlug. In diesem melodienreichen und ausnahmslos phantasievollen multiplen Konzert treten vier Solo-Instrumente in ständig wechselnden Kombinationen auf: das Bläserpaar den Streichern gegenübergestellt, die beiden höheren Instrumente gegen die beiden tieferen, Violine und Fagott gegen Oboe und Violoncello (wie zu Beginn des Andante), oder einfach als Quartett kontrastierender Timbres. Verglichen mit der Dynamik der zeitgenössischen Londoner Symphonien wirkt der erste Satz, ein Allegro, geruhsam und kultiviert, wobei (für Haydn) relativ wenige Harmoniewechsel vorkommen. Mit vier zu präsentierenden Solisten verfolgt der Komponist die Strategie, zu bezaubern anstatt herauszufordern. Klangfarbliche Kontraste und virtuose Vorführungen haben den Vorrang gegenüber komplexen thematischen Erörterungen. Von dem Augenblick jedoch, wenn die Solisten fast beiläufig in der Mitte des Anfangstuttis einsetzen, ist die Musik voller Haydn’scher Schlagfertigkeit und Raffinesse. Bei dem „offiziellen“ Solisteneinsatz teilen die Streicher- und Bläserpaare in kunstvoller Weise zwei Aspekte des Hauptthemas: Geige und Cello singen abwechselnd die lyrische Eingangsphrase, während die ausgelassene Antwort des gesamten Orchesters von Oboe und Fagott neuinterpretiert wird. Die Durchführung ist besonders inspiriert; sie beginnt mit dem Hauptthema (auf dem Cello) in der geheimnisvollen Tonart Des-Dur—was nach F-Dur fremdartig und üppig klingt—, worauf sich ein wunderschöner imitativer Dialog mit anrührenden, chromatischen Figuren am Rande entwickelt. Diese imitativen chromatischen Strukturen werden in der aufwendig gestalteten Kadenz—der expressive Höhepunkt des Satzes—noch einmal aufgegriffen. Das F-Dur-Andante, in Haydns bevorzugtem 6/8-Pastoralrhythmus, lässt Trompeten, Pauken, Fagotte und eine der Orchesteroboen aus. Dieser reizvolle Satz ist im Wesentlichen entspannte Kammermusik für die Solisten, was kurz von einem unerwarteten Auftreten des Hauptthemas im Orchester unterbrochen wird. Mit „plötzlichen, überraschenden abrupten Pausen“, wie das Londoner Blatt Oracle es formulierte, kommt das Finale in Sachen Überschwänglichkeit und Kontrapunktik den Schlusssätzen der ersten sechs Londoner Symphonien gleich. Nach einem bewegten Tutti wird das Auftreten eines griffigen Kontretanz-Themas zweimal von scheinbar ominösen Rezitativen für Salomon hinausgezögert. Später wiederholt Haydn diesen Trick nach einer weiteren brillanten kontrapunktischen Durchführung. Kurz vor Ende wartet er mit einer letzten Überraschung auf, wobei die Musik von der scheinbar fest verankerten Grundtonart B-Dur nach Ges-Dur wechselt—ein theatralisches Pendant zu der ähnlichen harmonischen Eröffnung der Durchführung des ersten Satzes.